• Audio Commentary One - this archival audio commentary features Hitchcock scholar Marian Keane. The commentary was recorded exclusively for Criterion in 2001, and initially appeared on the label's DVD release of the film. • Audio Commentary Two - this archival audio commentary features film historian Rudy Behlmer. It was recorded in 1990, and initially appeared on the label's LD release of Notorious. • Once Upon a Time... "Notorious" - David Thompson created this documentary for the French DVD series Once Upon a Time... in 2009. The material that is used in it addresses the socio-political climate in which Alfred Hitchcock directed Notorious and some of the key themes in it. It uses clips from archival interviews with the famous director, Claude Chabrol, Stephen Frears, film historians Bill Krohn and Sidney Gottlieb, biographer Charlotte Chandler, Isabella Rossellini, and Peter Bogdanovich, amongst others. In English and French, with imposed English subtitles where necessary. (52 min, 1080i). • Powerful Patterns - in this brand new program, film scholar David Bordwell deconstructs the finale of Notorious and Alfred Hitchcock's management of the atmosphere throughout the film. The program was created exclusively for Criterion in 2018. In English, not subtitled. (30 min, 1080p). • Glamour and Tension - in this brand new video interview, cinematographer John Bailey (The Big Chill, The Mafu Cage) discusses the visual style of Notorious as well as some key techniques that Alfred Hitchcock incorporated in his directing style over the course of his career. The interview was conducted exclusively for Criterion in 2018. In English, not subtitled. (24 min, 1080p). • Poisoned Romance - in this new program, Donald Spoto, author of The Dark Side of Genius: The Life of Alfred Hitchcock, discusses Alfred Hitchcock's relationship with David O. Selznick, the production history of Notorious, and the film's narrative construction. The program was created exclusively for Criterion in 2018. In English, not subtitled. (21 min, 1080p). • Writing with the Camera - in this new program, filmmaker David Raim examines the conception of Notorious, with a special emphasis on Alfred Hitchcock's involvement with the pre-production process. Included in it are clips from interviews with production designer Robert F. Boyle (The Birds), storyboard artist Gabriel Hardman, production designer Henry Bumstead (Vertigo), film critic and author Bill Krohn, and author Steven Katz, amongst others. In English, not subtitled. (16 min, 1080p). • Lux Radio Theatre - this radio adaptation of Notorious features Ingrid Bergman, Joseph Cotten, Joseph Kearns, Gerald Mohr, and Janet Scott. It was originally broadcast on January 26, 1948. In English, not subtitled. (60 min, 1080p). • Pathe Reporter Meets... - presented here is an archival newsreel in which Alfred Hitchcock welcomes Ingrid Bergman to the United Kingdom. The segment was shot in 1948. In English, not subtitled. (1 min, 1080p). 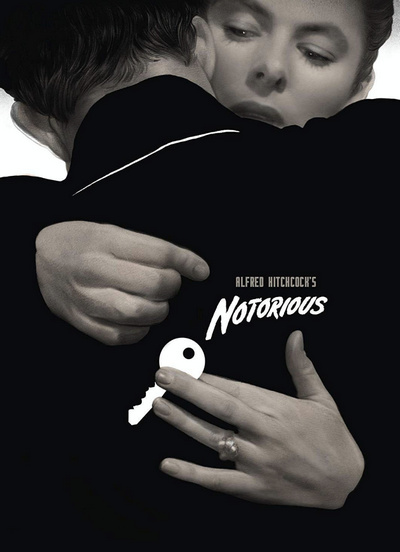 • Trailers - presented here are four vintage trailers for Notorious. In English, not subtitled.